Today – the International Black Ribbon Day – marks 75 years since Nazi-Germany and the Soviet Union signed a non-aggression pact that plunged our continent into a conflagration that destroyed the lives of millions of Europeans. The day has been marked throughout the world, most notably in those countries that fell victim to the Hitler-Stalin pact. 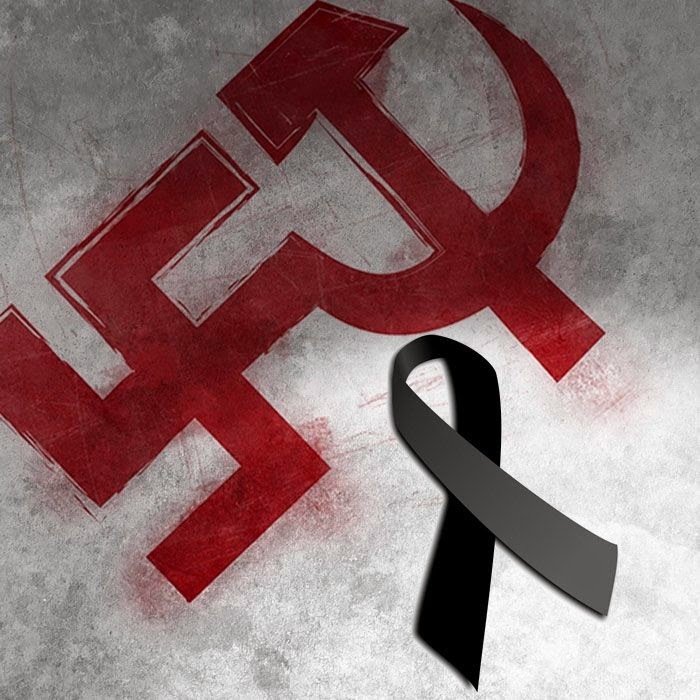 The European Union has declared this day the European Day of Remembrance for Victims of Stalinism and Nazism. The Finnish Anti-Fascist Committee has, for several consecutive years, been the only organisation in Finland to mark the Black Ribbon Day. Our association has proposed that the day be recognised as an official flag day in Finland. Speakers at many events today have pointed to the fact that the importance of the Black Ribbon Day has been widely ignored in Europe, and that our continent seems to be teetering on the brink of another major conflagration. The criminal gang that has usurped power in Russia has once again waged war against its neighbour. With the force of arms, the imperialist aggressor has conquered large areas of the sovereign territory of a neighbouring state. The impotence demonstrated by European democracies in the face of this blatant crime against international law and peace on our continent will be recorded in history books as the greatest shame of our generation. In an ironic twist, German chancellor Angela Merkel has today visited Kyiv to exert pressure on Ukraine's President, Petro Poroshenko, calling on him to make concessions to the aggressor that is waging war against free Ukraine. Tomorrow marks the 23rd anniversary of Ukraine's independence. At the same time, the Ukrainian nation, having freed itself from corrupt tyranny, is fighting a bloody battle against the forces of occupation and their agents in Eastern Ukraine. The Finnish Anti-Fascist Committee wishes to express its unreserved support to the Ukrainian people's fight for freedom and independence and to pay respect to the hundreds of Ukrainian patriots who have fallen in battle. Right at this moment, Ukraine is fighting in defence of a free Europe against the forces of reaction and oligarchy. The fate of our continent depends on Ukraine's freedom; European democracies are obligated to join this battle. Thank you for your support, brothers.